Antiquaires since 1970, siret: fr 24.430113233. Popular discovery carved bone 1894, oasis el golea: amazing tool. Very surprising object, all hand cut, sheep bone or dromedary, shaped multifunction tool with 16 decorative blades, or vaguely utilitarian as: toothpicks, ear picks, various hooks, centimeter, small forks or various other blades . All fall back between the 3 openwork dishes of the handle. This object was manufactured by a French engineer soldier, employed in the preparation of the telegraph lines which were to lead to the oasis of el Golea, Algeria. It was the time of French penetration in the Sahara, the telegraphist may have met Father Charles de Foucault? Engraved text: January 14, 1894, telegraphic mission of El Golea. Dimensions: 12cm x 3cm x 3,5cm closed, and 23cm open. Condition: good, but some blades are incomplete or missing. Our warranty commits us as follows: we are not experts, but we refund 100%, without questions and with our apologies, any person disappointed by our shipment, within the reasonable period of 15 days. No risk for our customers! The sending of this object 0 for France, and 20 for Europe. Primitive discovery carved bone 1894, El Golea Oasis: amazing tool. 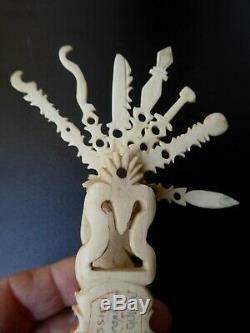 Very surprising object, all hand cut, sheep or camel bone, shaped as a multifunction tool with 16 decorative blades, or vaguely utilitarian as: toothpicks, ear picks, various hooks, centimeters, small forks or various other blades. All fall back between the 3 openwork plates of the handle. This article was made by a French soldier, used to the preparation of the telegraphic lines which were to lead to the oasis of el gola, algeria. It was the time of french penetration in the sahara. The telegraphist may have met father charles of foucault there? Engraved text: January 14 after 1894, telegraphic mission of el golea. Dimensions: 12cm x 3cm x 3.5cm closed, and 23cm open. Condition: good, but some blades are incomplete or missing. The item "popular discovery hand-carved, 1894, oasis el goléa amazing tool" is on sale since Thursday, February 21, 2019. It is in the category "art, antiques \ objects of the nineteenth and before". The seller is "dany46" and is located in bellegarde, in camargue.